Tina's Crop Shop: GIU Post #4 - Love You This Much! I love this card so much! Love the owl stamps! Have them all and they are the cutest! Thanks for sharing your talent. I love this owl card, the wood look background is really neat. I like how you put him on a hill instead of floating...good idea. Little tips like that are great! so exciting for me when I love a card and I have the stamp used....gonna go make this one right ;away...love it! This is so adorable. Love that owl. This guy is adorable. I really like the few extra touches you add like the twine and dots. This is so cute!!!! You’ve done an awesome job! Very cute!!. I love Lisa Arana's Owls!!!. Made me smile. Love the wood plank background and the adorable owl. I love this card. Owls are my favorite right now. Very creative. Like the background for this owl stamp. The little owl is adorable, and looks great with the wood background. Is he a barn owl, because the wood looks like barn wood. Nice job. It's fun to see this little guy come to life in your card! Love this cute owl! Darling card! Can’t go wrong with that pretty background paper. I love the owl stamps you can do so many things and unlike me their ageless. So sweet!!! I will have to case this!!! I’m in love with this card! It is adorable. Love the color choices too ! Love your adorable and cute owl card.I,also, loved your fabulous background.Thanks for sharing your creativity. I love owls, too! I have a couple of this cutie. 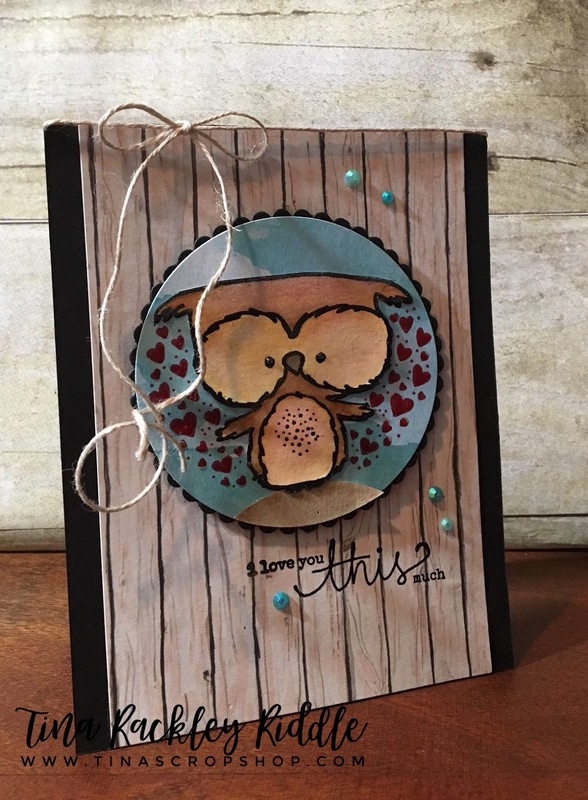 Love your card and the wood paper BG. Cute design. Unity's owl stamps are always so adorable! You did such a good job with it. You color chose has made me reconsider some combination. Oh my gosh, I love this card! It's adorable! Aren't the owls just the best? I only have two, but I'm looking for excuses to get more! I love this adorable warm and happy card! Love the little owl! Beautiful! I love the dimension. The owl is popping out of the tree. Love the patterned background. Great job! So super cute. I love all you added to the "background" to make that adorable owl "pop". Great job! I just got this stamp set! I love the owls and this whole card. That owl is super cute ! Unity's owl designs are some of my faves! Love this cute card!